Youth Center with Judith Arteaga! Click on the Pictures to see a bigger version of them! 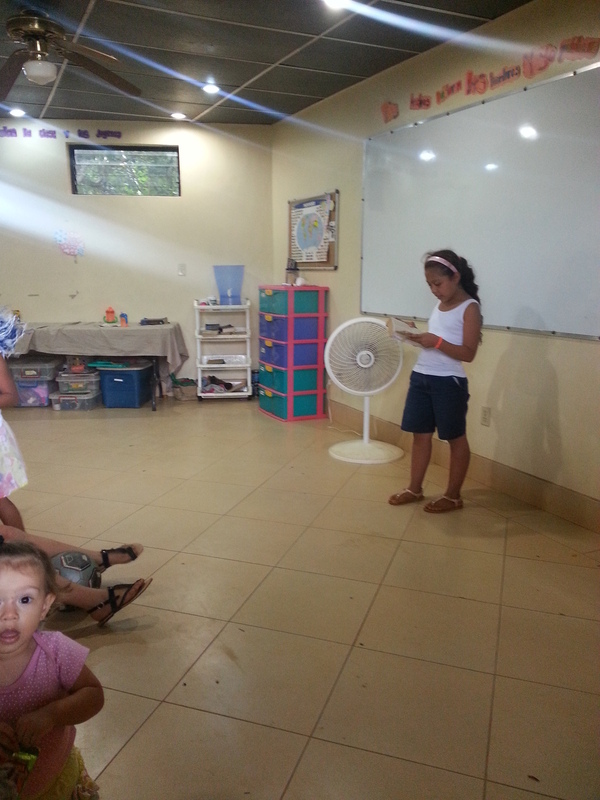 Judith's letter that she wanted to share with you in Spanish! Judith is 12 years old now! And sharing Jesus commands with kids her age and younger! My experience giving the youth center has gone very well! Even though I was nervous but the time went very well, the little girls acted very well and listened to me. They liked the youth center even though they don't know the worship songs yet but they were very attentive! The girls were a little embarrassed at the beginning because they did not know me very well. I felt the desire to do another youth center day. I shared the 10 commandments and they liked that class. All of kids don't share in class but one of them was helping me a lot! Thanks for asking how my time went! Pastor Carlos y Gabriella hacen el centro de Jovenes los Miercoles a la 2 pm hasta la 4 pm. Los niños siempre estan alegres preguntando si va a ver centro. Ahora hay centro cada dia! Pastor Carlos and Gabriella do Youth Center on Wednesdays from 2-4pm. The kids are alaways happy and asking if there will be youth center the day of sometimes even coming early and yelling for the teacher in expectation! Carla just had her 15'th birthday recently. Pastor Carlos and the family put on for her a quinceañera which is a special 15 birthday party which is like a rite of passage for a Latino Girl. Here we see that Pastor Carlos also add's a twist to the night in giving Carla a promise ring. That she would remain pure for Jesus until she marries. The event was formal like a wedding. Judith Arteaga's trip to the "Pet's Hospital"
Thanks always to God, because He always has control of everything. My daughter Judith Arteaga who several years ago had a hip surgery has now had to go back for checkups to see how her bones have continued to develop. This last trip was at "Hospital La Mascota" or the Pets Hospital which is really a kids hospital not a pets. Upon arriving they changed our date so we have to come back 15 days later. The doctor that attends children was busy with surgery's and couldn't attend us. Leaving the hospital after breakfast a cousin of Gabriela came to bring us to his house where Gabriela aunt lives. In the house of Gabriela one of the children got sick with a strong pain in the kidney. We prayed for him, and he got better, after his brother took him to the hospital "Monolo Maarales," and I went with them. There I was able to to visit those that are sick with Cancer and Leukemia. I went to visit a boy called Rafael. And entering the room I could see the face of Ragael who looked very happy even though he had leukemia. His mom told us that he is Christian thanks to God and he has given his suffering to God. I went to encourage the boy talking to him about the love of God and the power of God and to let God do according to his will. Because many times we try to force God instead of waiting for his will, the boy expressed his wishes that he too only wanted to wait on the will of God because God is who really is in control of his life. After visiting with all the kids in the room and encouraging that to wait and trust in God the kids where all encouraged so I left. I am pleased with God because I got home to Nueva Guinea thanks to Him. I am excited to go and to finish the next doctor's appointment with Judit. God bless you, Thanks you all for your prayers and support. The vision and the mission of Calvary Chapel Nueva Guinea is making disciples for Christ. This is the purpose and objective that we are fighting for. We want to complete this objective, so we have been working towards this, equipping the youth and the adults in the gospel to serve Christ Jesus. Our goal is to make disciples that are firmly planted and deeply rooted in the word so that when trials come, they will be victorious in Jesus. Yeltsin and Jhonny are two youth who have struggled in the past. They have both show great interest in growing in the LORD and want to have a good testimony before God and before the brothers. They are both currently being disciple. These two young men have visited the church since they were kids. Our prayer is that they would be men of God, fishers of men, and ministers of grace that stand fast in Christ. My daughters, Karla and Judith are also taking discipleship class along with a sister named Tania Lopez. We ask that you pray for these young students. Pray that they would grow and that their faith would be strengthened in the LORD. Thank you very much and may God bless you today and always! Choreography of song "Sobre Alas de Paloma"
I give thanks to God because he permitted me to pass this year with good grades. Now I am going to be in the 6th grade. I give thanks to God for my life because God has permitted that I can control my anger more or less. God has also allowed me to learn his word, to learn bible verses, and much more for allowing me to to do a choreography (christian dance presentation) with my little sister and we did it to please God. God bless you and that one day you can come here. I am 11 years old and this is my thanksgiving card. Hi this is Judith, Hola soy Judith, doy gracia a Dios porque me permitió pasar el grado con buenas notas. Ahora voy para el sexto grado. Doy Gracias a Dios por mi vida porque me a permitido que yo pueda controlar medio medio mi enojo. Me a permitido aprender de su palabra, aprender textos biblicos, y mucho mas por permitir que salí con excelentes notas. También doy gracias porque voy a sacar una corografia con mi hermanita y otras niñas y lo bamos a hacer para agradar a Dios. Dios les bendiga y que puedan algún día benir aquí. Soy Judith tengo la edad de 11 años y esta es mi carta de agradecimiento! Judith Arteaga on the right. I want to give thanks to Jesus because he is big and good! For his grace all this year because he has permitted me to learn more from him, because he has helped me in my studies. I give thanks for this year and that I have gotten to know new persons and others that have helped me and strengthened me in God. I give thanks to God because I have finished my classes and God has permitted me to pass this grade. Also, I give thanks because he has given me an new friend and because I am writing this letter in my life to see all his wonders! Karlita Arteaga -- God bless you! Carla is on the Left with the Purple Shirt. Le doy gracias a Dios porque el es grande y bueno, por su gracia todo este ano. Porque me permitido aprender más de El, porque me ayudo en mis estudios. Le doy gracias porque en este ano y conocido a nuevas personas y a otras que me han ayudado a fortalecerme en Dios. Le doy gracias a Dios porque ya salí de clases y porque me permitió pasar del grado. También doy gracias porque me hice nuevo amigo y porque estoy escribiendo esta carta y medio la vida para ver todas sus maravillas! All God has done in 2014! *Discipulado a hermana Bilma y Marling. *Bilma esta terminando la clase, pero le faltan algunas taraes. *Enseñando algunos sábados en el estudio de mujeres bajo el tema mujeres notables de la Biblia. *Doy clase dominical Domingo en la noche el culto mas lleno de niños. *Visito algunas familias con Pastor Carlos mayormente los familias que han dejado de llegar regularmente a culto, los enfermos eso lo hicimos los Jueves en la mañana. Por cado uno de estos ministerios pido sus oraciones que puedan siempre recordar esta obra que Dios tiene aquí en Nicaragua. Ahorita estoy entrenando 4 niñas para formar un grupito de danza en la iglesia. El propósito es poder ayudarlas a crecer espiritualmente orando y compartiendo un versículo de la Biblia y luego practicamos. Estoy haciendo vestidos para ellas, para que todas puedan tener un solo traje. Ellas están muy contentas en servir al Señor en este ministerio. Estoy orando por mas niñas que se entregan al grupo. Pero también pido oración para que Dios provea. La tela para los vestidos para los demás materiales que necesitan. Oran por favor por esto. Y por las canastas básicas y algunos juguetes para las actividades del fin del ano con los niños. Gracias de antemano por sus oraciones y que Dios les Bendiga mucho que pasen una Feliz Navidad y tengan un propero avo nuevo en 2015! Atentamente, que Dios les bendiga mucho! *Youth center on Wednesdays at 2pm in the afternoon and at 6pm at night. *Bilma is ending the class, she’s just short some of the homework. *I taught some Saturdays in the Women’s studies and the theme was Notable Women of the Bible. *I gave children’s ministry classes Sunday night – that’s our fullest class. *I gave class to the elementary kids a the Zone #3 school at 2pm. *I visited families with Pastor Carlos my husband, mostly the families that had stopped coming regularly to church, the sick, we did this Thursday mornings. For each one of these ministries I ask your prayers my hope is that you can always remember the work God has here in Nicaragua. Right now I am teaching 4 girls in the dance group in the church. The purpose of the class is to be able to help them grow spiritually, I am praying and sharing a bible verse with them and then after we practice. I am making dance dresses for them, so that each girl can have their own dress when they perform. The girls are very content to serve the Lord in this ministry. I am praying for more girls that will join the group. But also, I ask for your prayers that God would provide. That God would provide the cloth to make the dresses. Please pray for this. And also for the Christmas baskets for the poor of Nueva Guinea. We also would like to give some small toys for Christmas to the kids. Thanks in advance for your prayers and that God would bless you a lot, have a Merry Christmas and a prosperous new year in 2015!